This remarkable photograph has a misleading label on the back. It says “Claude Bracey, 1928 Amsterdam Olympics” and that’s almost right. That is indeed Claude Bracey breaking the tape at the far left. Bracey was Rice’s first real track star and he did run in Amsterdam, the first Rice athlete to compete in the Olympics. But as someone who lived many years in Chicago I knew at a glance that the race we see above was run in Soldier Field. It turns out that it was the 1928 NCAA track championships and Bracey won both the 100 yard dash (9.6 seconds) and the 220 (20.9). Soldier Field itself was only a couple of years old. Later this week I’ll explain where this image came from and show some more pictures from what is turning out to be a really wonderful new collection. 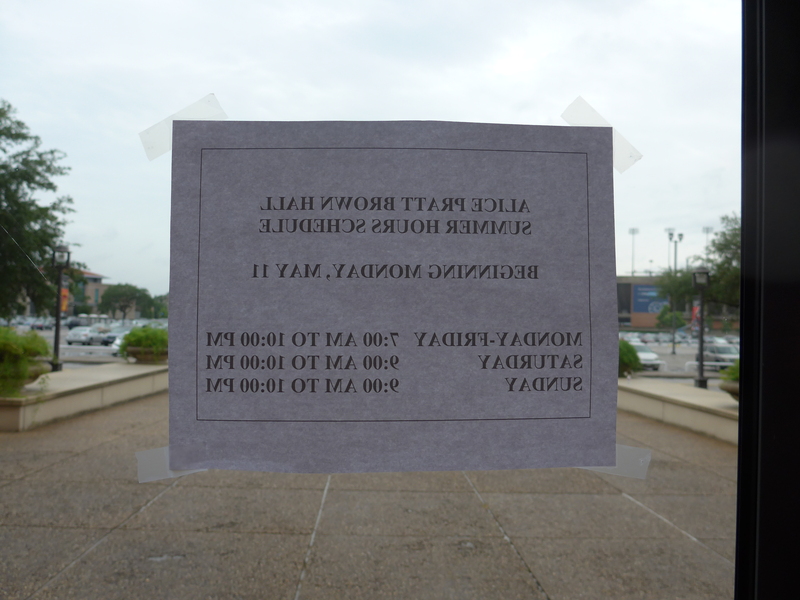 Bonus: I’m declaring Summer Hours. Don’t worry unless I’m gone for at least three days with no explanation. Who is on the other end with what appears to be the same uniform? 2. George Simpson, Ohio St.
3. Wes Foster, Washington St.
5. Arthur Engle, Iowa St.
4. Arthur Engle, Iowa St. The photos shows a Notre Dame runner. Is this the finish of a heat race? I had the same thought about the runner in lane 1. It certainly appears to be another Rice competitor. Are there any athletic department records that might shed light on this? I think the stripe on the guy’s shirt in lane 1 is lighter than Bracey’s. In color it would probably be more obvious. Ernest Weichert is mentioned in several Threshers and the 1929 Campanile (p. 268: http://www.e-yearbook.com/yearbooks/Rice_University_Campanile_Yearbook/1929/Page_268.html) as being the Owl’s second-best sprinter to Bracey. They finished 1-2 in both the 100- and 220-yard races the SWC meet. I can’t see the Campanile photo well enough to see if Ernest might be the lane-1 competitor in the photo above, but a check of the actual book may help. I haven’t seen any list of Rice sprinters who competed that 1928 NCAA meet. 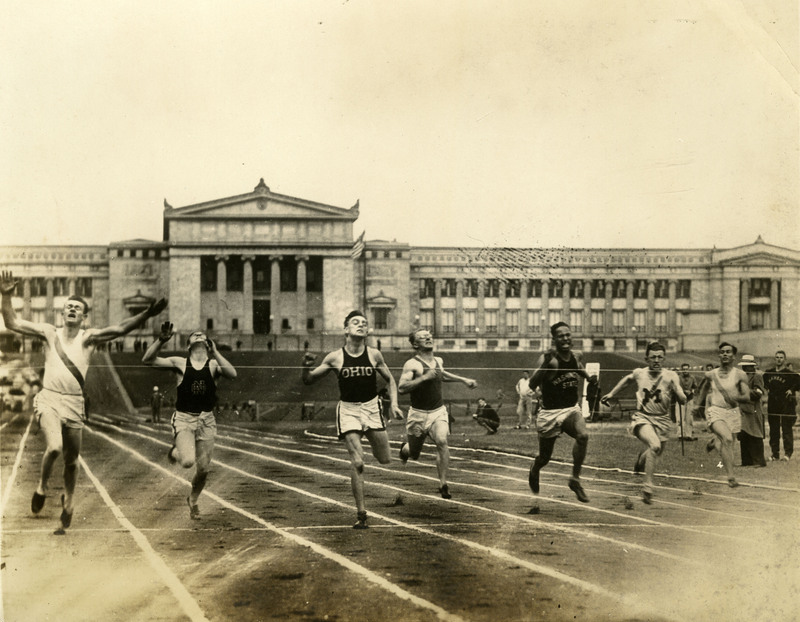 Also, note that there are seven racers in the photo, but only the top six are listed in the results (http://usctrackandfield.com/1928_results.pdf). It does look like “Ohio” (State?) and “Washington State” are 2nd & 3rd in the photo, which is consistent with the final results. But maybe it was a semi-final heat? I haven’t found any accounts of any of the earlier heats. the 1928 Olympic Trials took place on June 6-7 in Cambridge, Mass. It sounded like quite an ordeal for the sprinters: All four rounds of races — from prelims to finals — were held within four hours of the first day (from 3:30-7:30p.m), “the last race in piecing cold and windy conditions.” (https://www.usatf.org/statistics/champions/OlympicTrials/HistoryOfTheOlympicTrials.pdf): The winner was a high school student from Glendale, Calif., Frank Wykoff, who went on to win Olympic gold medals with as a member for three U.S. 4×100-meter relay teams (1928-leadoff, 1932-anchor and 1932-anchor). In Amsterdam, Wykoff finished 4th in the 100. (Bracey won two preliminary heats but finished 5th in his semifinal (http://en.wikipedia.org/wiki/Athletics_at_the_1928_Summer_Olympics_%E2%80%93_Men%27s_100_metres).